Emirates Airline EMIRA.UL plans to more than double its network of U.S. destinations in the next three to five years to a total of 15 U.S. cities, up from seven currently, a company official said. Emirates plans to add as many as three new U.S. city destinations in the next 12 months, Thierry Antinori, chief commercial officer, said in an interview with Reuters. The comments mark a further sign of the expansion aims of one of the fastest-growing Middle Eastern carriers. 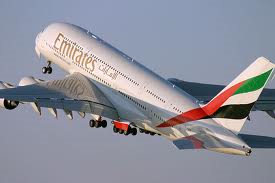 Emirates is set to add new service from New York’s John F. Kennedy airport to Milan in October. That route, known as a fifth-freedom route because it goes between two countries other than the carrier’s home base, is out of step with Emirates’ Dubai-centric, single-hub strategy, but is not a sign that more such routes will be added in the future, Antinori said. The freedoms of the air are a set of commercial aviation rights. The fifth freedom allows an airline to carry traffic between foreign countries as part of services connecting with the airline’s own country. The Dubai-based carrier has increased U.S. destinations “overproportionally” in the last 18 months, adding three routes to four existing ones. It now flies to Dubai from New York, Houston, Los Angeles, San Francisco, Seattle, Dallas and Washington, D.C.
On December 2, Emirates will add capacity on its Los Angeles Dubai route by using a bigger jet — an Airbus(EAD.PA) A380 — to replace the Boeing (BA.N) 777 it currently uses. The airline’s two daily flights from New York already use the 525-seat A380 superjumbo. “The next step in the U.S. development is to open a third flight from New York going to Milan,” Antinori said. “The step after that will be to open new destinations between U.S. and Dubai,” he added. The cities haven’t been decided, but Chicago, Boston and Miami are possible, he said. In the three to five years, the airline will have 15 routes from the U.S. to Dubai, he said. Emirates also is very interested in Boeing’s new 777X jet and probably will announce orders at the Dubai Airshow in November, he said. While not confirming it officially, Antinori noted that the airline did not order planes during the Paris Airshow in June. Antinori said Emirates does not plan to buy equity in other airlines, including Spicejet (SPJT.BO) of India, which had been rumored to be of interest. “We are not interested in investing in stakes in airlines, including Spicejet,” he said.